My previous race experience has been very focused on sprint racing in single make series. I started racing with the Caterham Academy in 2011, a novice only series aimed at car fans looking for an easy way to get in to competitive motorsport. It was one of the best decisions I’ve ever made; it allowed me to race in a very competitive series, while making some lifelong friends. 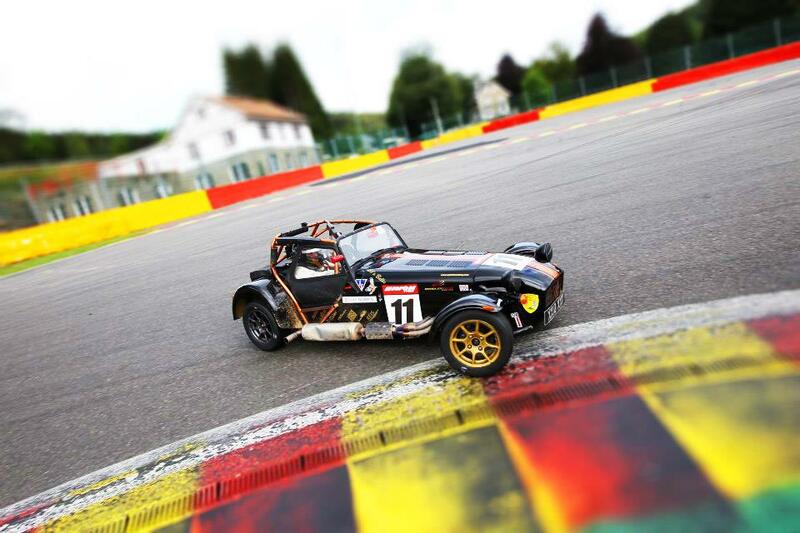 Not only does Caterham provide a great entry to racing, but it also allows for an excellent path for progression. The Academy car can be upgraded through Roadsport, Tracksport and finally Supersport. Giving an ever more competitive and exciting car. After enjoying an amazing two years of racing with Caterham, my daughter was born, which put my racing on hold for a couple of years. 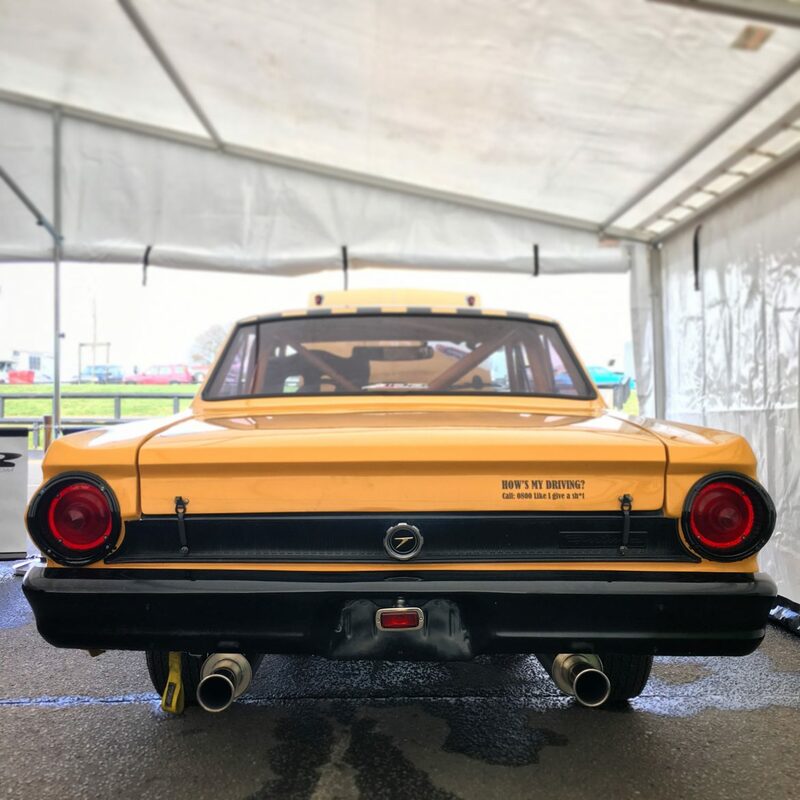 I’ve always had a passion for classic cars, something that’s evident from my eclectic car collection, so it was just a matter of time before I moved to racing one. 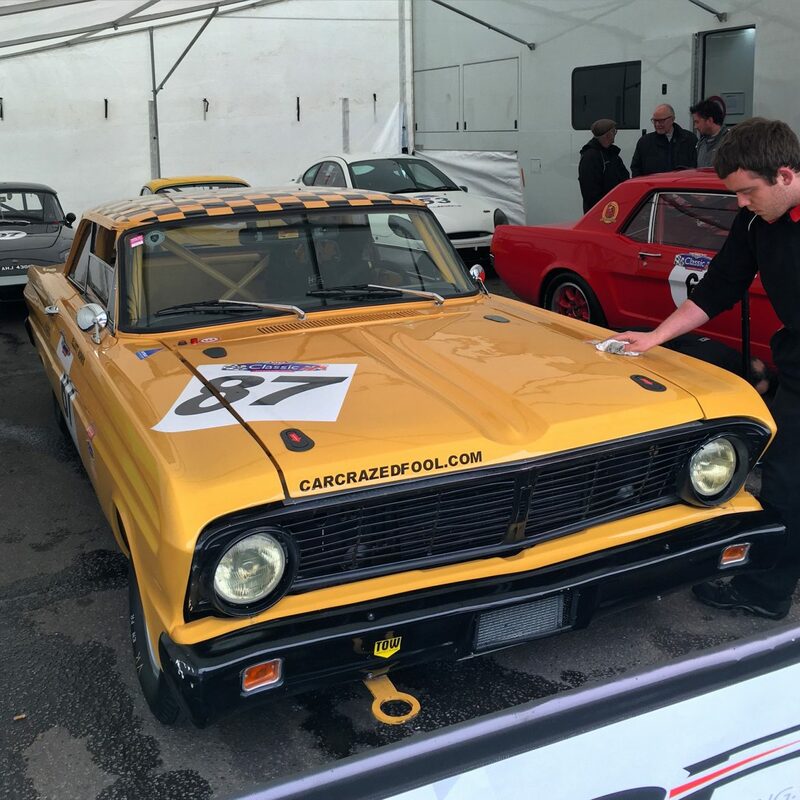 The opportunity came up when I spotted the ’64 FIA Ford Falcon in the Silverstone Race Retro auction. Wanting to duke it out with friends in their FIA pre-66 Mini Coopers, I decided the Masters Pre-66 Touring Cars was the way forward, but for the first event of the year, keeping in mind I hadn’t driven the car, we decided to stay a little closer to home and head to Snetterton for the CSCC Season Opener; entering the Swinging ‘60’s and Classic K races. Arriving early on the Friday morning for the race weekend test day. I found the big yellow beast under a very professional John Danby Racing (JDR) awning, parked next to a very fancy looking race truck. I’d had one eye on the weather all week, keeping my fingers crossed that my first outing in the taxi would be in the dry! Rumbling down the pitlane, the first realisation is just how much room there is in the cabin, stripped down to the race essentials, the space is vast. The flip side of the airy cabin is the fact the outside of the beast is equally huge, taking up an unfamiliar amount of track. Compared to a Caterham, this is the Titanic. The acceleration is nothing short of impressive, mid-corner balance, although lose is very manageable, the car enjoying to rotate on the throttle. It’s a lot of fun; entertaining and a challenge. The brakes are nothing short of terrifying; you have to write them a letter asking them politely to slow the car down at the next corner. They need a serious amount of mental adjustment; on my second lap I almost brought my race weekend to a very swift halt. In a Caterham, the first corner at Snett, ‘Riches’, is a small lift to get the car turned in and then back on full power. Feeling over confident with the first lap, I lapsed in to considering the Falcon like a Caterham. Getting a good run down the pit straight, I kept the old girl pinned, the speed building fast. Wait, wait, just a little longer, hit the brakes. Nothing! They literally did nothing; it felt like there was more deceleration from lifting from the throttle than there was from applying the brakes. This foolhardy bravery lead to a quick jaunt across the grass, moonshine running style!